When it comes to intensity, remember super typhoon Haiyan and Cyclone Pam. Then there was the major flooding in central Japan this week from Typhoon Etau. It will probably be several decades before it becomes quite clear whether a) cyclones will be more intense and b) they will become less frequent this century. Axel made some ground when he spoke in positive terms about The Uncertainty Handbook. But then spoilt it when he became confused by a recent paper in Nature Climate Change. And arguably spoilt it again when he wrote how the only certainty in climate science is that humans are causing warming. I won't quibble too much with him when he thinks everything else is more or less controversial. There is still a lot to learn about what will happen with global warming. I'll just mention that there's no controversy about the oceans becoming more acidic, or that ice is melting - although by how much and how quickly are active areas of research. I don't particularly object to the rating in each category - that is, denier vs science. What I take issue with is the linear rating. I'd argue that conspiracy blogs like WUWT and extreme denialist sites like Eike can't be put on the same scale as websites that publish science. I'd also argue that "alarmist" is not a suitable description of websites that write about science. Enough of Axel's article. What about WUWT? There is lots wrong with that paragraph. For a start, Pierre wrote about "huge uncertainty" rarely getting properly mentioned, and hurricanes. This is contradicted by the IPCC AR4 report he mentioned, which, as quoted above, talked about "less certainty" in regard to a drop in frequency - meaning there is a lot of uncertainty. It also stated that: "The apparent increase in the proportion of very intense storms since 1970 in some regions is much larger than simulated by current models for that period. ", implying that there is also uncertainty about whether the increase in intensity will persist. 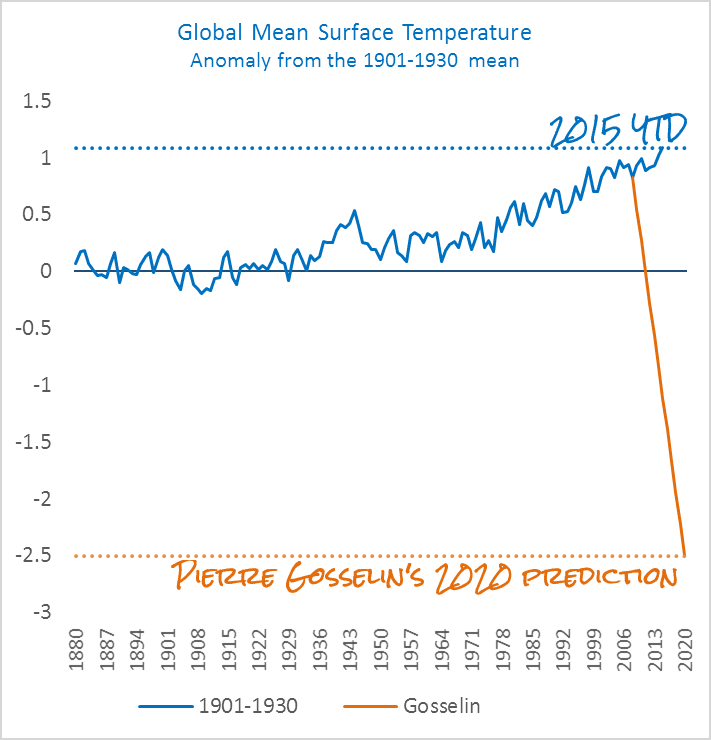 Deniers are not known for being accurate. Of course whether hurricanes make landfall in the USA or not is no indication of tropical cyclone intensity anyway. Axel didn't make that claim. Pierre's "false" is plain stupid as well as wrong. Arguably the most intense hurricane at landfall was Haiyan in the Philippines. It will take a few more decades before it is known whether tropical cyclones overall will become more intense this century than they were last century. Opinions aside, if anything can be said of his ranking it is that the alarmists in fact do not represent the often claimed overwhelming majority and that in fact a broad spectrum of different positions on the science truly exists – just as one should if the science is to progress and not morph into some sort of unchallengeable dogma. How he got that from the list is anyone's guess. What he means is also anyone's guess. Overwhelming majority of what? There are a lot of so-called opinions, but the fake sceptic "opinions" don't mean zilch. If you want an opinion based on fact you wouldn't go to a climate conspiracy blog, would you? If you want science to progress, you don't go to a knowledge retardation blog, where the fans want to stop climate science research. If sceptics got just 1/4 of the funding of Warmists then Warmism would be over and out. The question Warmists must ask themselves is this: Q) Why is it that pesky sceptics are still loud and proud? A recent UN global survery put climate change concerns last. ANSWER: Truth is cheap or free, lies and propaganda costs lots of money. I sit back to enjoy the replies to my statement of fact. Contrary to all evidence, Kev-in-Uk argues that if the science was sound then WUWT would "fizzle away". He's wrong. It is, and it hasn't. Analysing evidence is not something that science deniers excel at. Any neutrality has to be based on sound (climate) science. Since the climate science field seems devoid of much real science proper assessment or neutrality is nigh on impossible. Put another way – if someone publishes crap then they must expect it to be discovered. The real problem is that it has to be discovered OUTSIDE of the proper peer review channels i.e blogs such as WUWT. If the science were sound – blogs such as these would fizzle away…..
An anecdotal and probably meaningless observation (rant) about the current tropical cyclone and weather cycle in the Central Pacific (Hawaii! ): When is the madness (heat, humidity and lack of trade winds) gonna' end? The tropical cyclones forming off Mexico normally track south of Hawaii (in a parade). This summer, the cyclones have paraded north of the Islands blocking the trades and drawing warm, humid, unstable air up behind them. If I had wanted to live in this type of weather I would have moved to Guam (no offense, some of my best friends are Guamanian ...). Does this portend a virtual move to Guam? Seriously, I can't wait for those fluent in German to provide the accurate translation of the whole article. JG, I've read how cyclones are expected to move poleward as global warming kicks in. Could that be what's happening where you are? That proves it enough for me, then: it is all over, all the data is in! I'll admit I had my doubts about the thoroughness of the science at times, but now with definitive proof like that I can finally get on with my new sustainable life direction. In line with their "logic" and "knowledge of history", it's simply amazing how tobacco "skeptics" just "fizzled" away and got less as the science got more clear through the 50s, 60s, and 70s. Or did history actually unfold somewhat differently as huge corporate, political, and social interests were affected? I'll not worry overmuch about the dictionary definition and be perfectly happy with the term 'Alarmist'. When companies like Shell Oil are already planning for a world with 4C warming anyone with a claim to a 3 digit IQ ought to be alarmed. What's the alternative: concernist? Alarmist is usually used to describe someone who is raising alarm without good reason. "Alarmed" would be fine with me. Anyone who isn't alarmed by what is happening and likely to happen over coming decades is ignorant about climate, old (so they don't have to worry) or incapable of emotion and/or reason. Yeah, but if you call someone an alarmist that's a double edged sword: you are telling everyone something about your own belief system. Calling us alarmists is starting to look very stupid indeed as we witness how vulnerable we are to the world's climate. The smart denier would use the term 'warmist' if there was such a thing as a smart denier. And its interesting to speculate why the term 'denier' does or does not carry the same issues as 'alarmist'. Certainly it raises hissy fits among them that we don't seem to suffer from. I wonder if Anthony will see the smoke today? 'Alarmism' is to lie and/or exaggerate about something which is not real. It's therefore an insult when applied to someone who is raising the alarm over something that is real. Please don't confuse 'alarmist' with someone who is just 'alarmed'. The two are completely different. Yes, but use that insult and the accuser risks being accused of ignoring valid warnings. And as sea level continue to rise, drought spreads, imaginary pauses disappear etc etc. the fingers do start pointing. Whereas if you accuse somebody of denying the science you 'risk' in turn being accused of accepting the science. I'm OK with that. I think we have the better of the exchange. What I object to is when the deniers try to confuse terms (as recently when WUWT was calling people who accept the science deniers). But even that tactic indicates something pathetic about them. So as I said earlier, I'll not worry overmuch about the dictionary definition. And language is flexible: if deniers keep using 'alarmist' inappropriately then, over time, the accepted meaning will change in a manner that will come back to bite them when they are trying to convince future generations that they always accepted the science, they merely erred towards the low side of temperature predictions - as Anthony does when he remembers he is supposed to pretend to be a lukewarmer. I think Axel Bojanowski is someone HotWhopper would normally link to using an archive. Every single article of his I have read on climate is patent nonsense. But that is accepted because it brings clicks and add revenue. I have stopped reading Spiegel Online. If this kind of misinformation is deemed to be acceptable on climate, where I can judge it, I also do not trust them when it comes to other topics, where I cannot judge it. And the editors should know after all these years that Bojanowski does not abide by the 10 commandments. Thanks Victor. I'd not come across him before and I doubt I'll pay him any attention in the future, either. 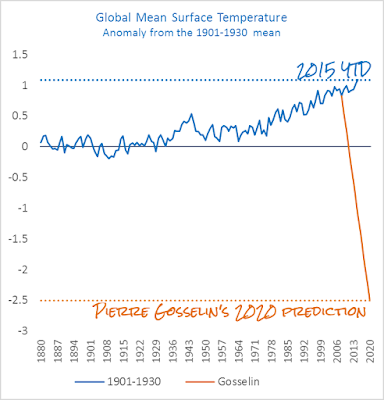 Little typo there: Gosselin surely predicted that the 'global mean surface temperature anomaly' would drop to -2.5C. Which admittedly is not much more probable than the mean temperature dropping to -2.5C. Yes. I meant drop down by 2.5C. I'll fix it. It wasn't clear from his comment what he meant. As you say, when the drop is as big as he suggested, it makes little difference whether it's a drop from the 2008 temperature (when he made his prediction) or a drop from the temperature at the turn of the twentieth century. Either way, it's a predicted drop of the anomaly from +0-1C to -2.5C, not a drop of the global mean surface temperature from about +17C to -2.5C.